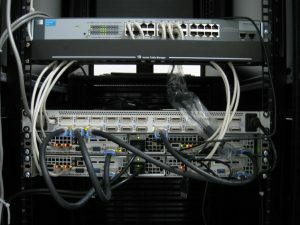 Both the manager and compute nodes of the cluster are built on a high-performance server platform Superserver 6015T-INFB and include two Quad-Core Intel® Xeon® 2 GHz quad-core processors (E5405, FSB 1333 MHz, 12 MB cache) and 8 Gb (four 2 DDR2 DIMM 667 MHz Gigabit Ethernet, ECC) RAM each. The combined peak performance of 24 cores on computing nodes available to external users is 192 Gflop. Real productivity achieved on the LINPACK test – 163 Gflop (about 85%). The control node also has a 500GB RAID array. On computing nodes, local hard drives with a capacity of 80 GB are used to cache temporary data. 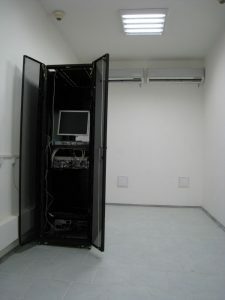 The cluster is mounted in a standard 19-inch server cabinet in a properly prepared room. Works on grid themes at the Institute are carried out since 2007. Since October 2008, the site is available to grid users in the round-the-clock mode. In 2012, Grid-node of IPEM G. E. The UAV-POWEON Fuzhou National Academy of Sciences named UA-PIMEE was registered and certified in the European grid community of European Grid Infrastructure (EGI – http://www.egi.eu). The information on the grid node status is highlighted in the monitoring of the NordoGrid International Consortium (http://www.nordugrid.org/monitor/loadmon.php).